Knowing and being able to share personal information is one of the most important life skills for our students to have. This might be achieved verbally for some of our students, whereas other students might work on handing over a personal identification or ID card. Some of our students might be working on filling out more detailed forms, and others working on writing their names. No matter where your students are at, they can (and should be) working on their personal information! 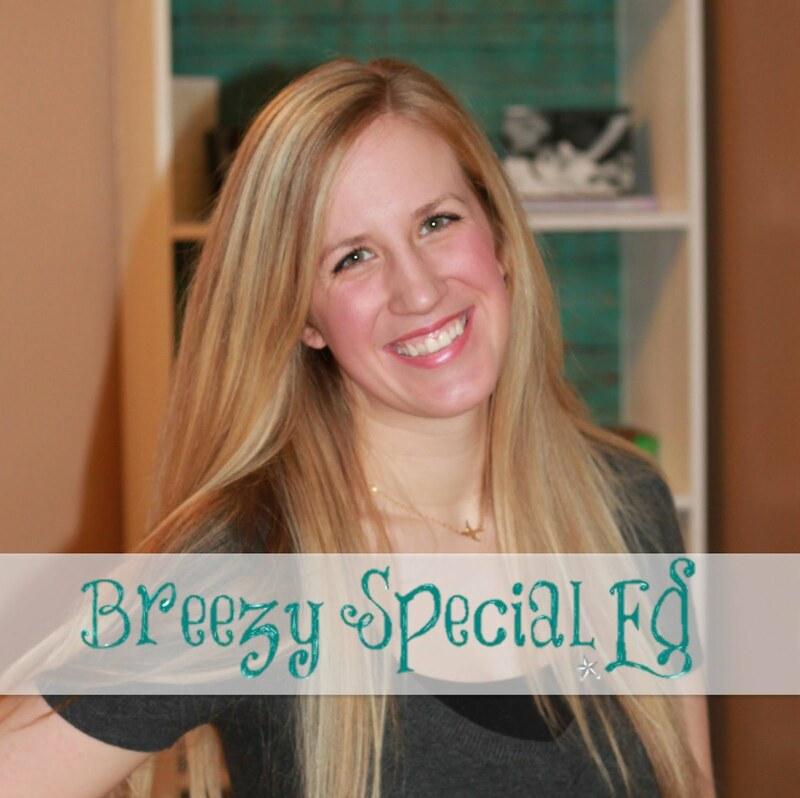 I love using personal information as an IEP goal, or an objective. It is an essential life skill and ties into language arts/speaking/writing standards as well. Student will match his personal information (a. name, b. address - street name. c. city, d. state, e. zip code, f. birthdate, g. age) with the appropriate section of a form. Given the following personal information: name, birthday, and age, student will a) trace personal information b) copy personal information c) write personal information without a model. One of the times we practice personal information is during our morning work or binder time. Each of my students have a form in their binders that they use to practice the personal information that relates to their IEP goal or what they need to work on. 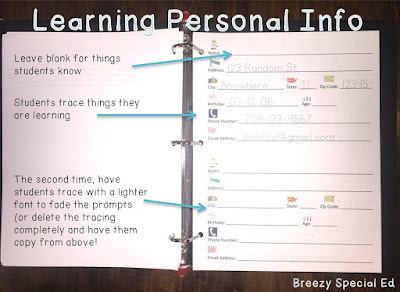 Some of these personal info worksheets are laminated with velcro so that students can match their personal information, other worksheets are laminated and students can use a dry erase marker for something like tracing their name, and still other worksheets are simply printed on paper so a students can practice filling in a form with a pencil and also so that I can continuously adjust what information they are working on. 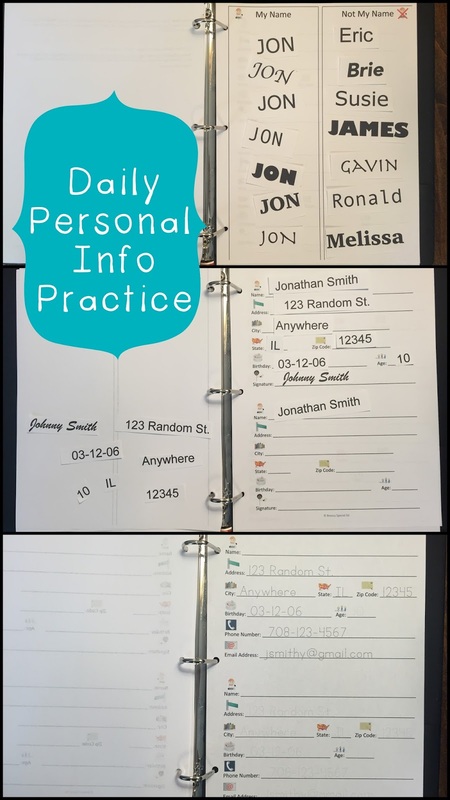 When a student is working on memorizing their personal information, I usually start with them writing the information they know without a model (such as their name), and then the information they are learning with a light tracing font. I will then physically fade the tracing font to a lighter shade of gray as the student gets more practice. Also, for each worksheet/form, students practice writing their information more than once, so I might have them trace it the first time, but then the next time it will be blank, so they can look up at the previous information to copy it, but will start learning the information as they do so! Practice Filling Out Forms Electronically! Our students who aren't able to write need to know their personal info too! You can program their personal information onto their devices and ask them questions to practice answering using their communication system. You can also print out an ID card for them to carry in their wallet, and ask questions such as "what is your name?" or "what is your address" and have them respond by having over the card (or if they have a state ID they can use, even better! I always recommend to my student's parents to get one of these for their child. Disabled IDs are FREE and great to have, especially if a kid gets lost or gets into a situation and doesn't know how to respond). I have also worked on recognizing their name in a simple, "my name" and "not my name" sort. You can also have students match their personal information (cut out in strips and laminated with Velcro) to a Velcro-ed form! If you want some editable personal info forms that are ready to go, check these personal info sheets out! What other suggestions do you have for teaching students their personal information? I love the way you have your objectives differentiated by letters- that makes so much sense! Teaching kids how to fill in forms is such an important skill!